Ferrari (NYSE:RACE) many analysts the iconic Italian automaker expect the Maranello outfit to deliver a Y-Y decline in earnings on higher revenues when it reports results for the Quarter ended September 2018. This consensus gives a good sense of the company’s earnings picture, but how the actual results compare to these estimates is a big factor that may impact its near-term stock price. The earnings report to be released on 5 November 2018, may drive the stock higher if the Key numbers are better than expectations, if they miss, the stock could move lower. 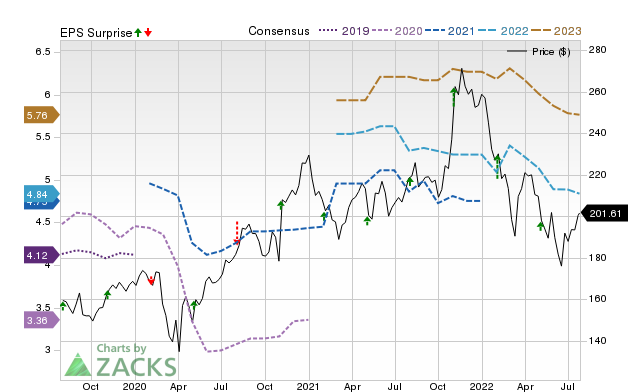 Any immediate price change and future earnings expectations will depend on management’s discussion of business conditions on the earnings call, I see a probability of a positive EPS surprise. Ferrari is expected to post Quarterly EPS of 0.81 in its upcoming report, which represents a Y-Y change of -6.9%. Revenues are expected to be $1.03-B, up 4.5% from the same year-ago Quarter. The consensus EPS estimate for the Quarter has been revised 6.95% lower over the last 30 days to the current mark. This is a reflection of how the covering analysts have reassessed their initial estimates over this frame. Estimate revisions ahead of a company’s earnings release offer clues to the business conditions for the frame whose results are coming out. A positive Earnings ESP is a strong predictor of an earnings beat. The Big Q: Will Ferrari will beat the consensus EPS estimate? Note: When calculating estimates for a company’s future earnings, analysts consider to what extent it has been able to match past consensus estimates. So, it it worth taking a look at the surprise history for gauging its influence on the upcoming number. For the last reported Quarter, it was expected that Ferrari would post earnings of 0.90/share when it actually produced earnings of 1.00, delivering a surprise of +11.11%. Over the last 4 Quarters, the Ferrari has beaten consensus EPS estimates 2X. Investors should pay attention several factors for betting on this or any stock or staying away from it ahead of its earnings release. Ferrari is the Aristocrat of the automobile sector, it pays a dividend, has been recently included in Bank of America Merrill Lynch’s US1 List. “We continue to believe that Ferrari is an iconic asset, with strong growth prospects, which makes it a very attractively priced stock following the recent sell-off,” analyst John Murphy said in a note to clients adding the company to it’s list of the best investment ideas of the bank’s fundamental equity research. New CEO Louis Camilleri “came through” on doubts that the company’s initial Y 2022 financial outlook introduced by the former chief would remain. And there’s “another whole leg of growth opportunity” well beyond Y 2022 given that targets do not include benefit of the Purosangue (FUV) or even a new HyperSuper car, the analyst said.